Tender asparagus is such a treat. 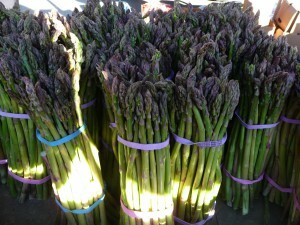 I can’t resist buying a few bunches when it first shows up for the season in our local farmers markets. It is delicious alone but also pairs well with so many ingredients, such as grains. Farro, a type of whole grain with a nutty taste, is a staple that I keep in my cupboards. It can be cooked in a number of ways and used in salads, soups and stews. 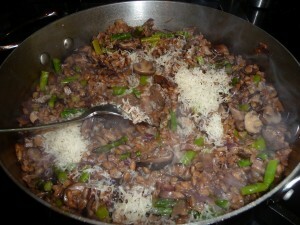 My favorite way is to cook it risotto-style with fresh vegetables (such as asparagus) and stock. And to finish it off with a rich parmigiana reggiano cheese and a drizzle of my favorite extra-virgin olive oil. Heat the stock in a medium saucepan until it just starts to boil. Reduce the heat and keep it hot. Meanwhile, heat 4 Tablespoons of olive oil in a large skillet over medium heat. 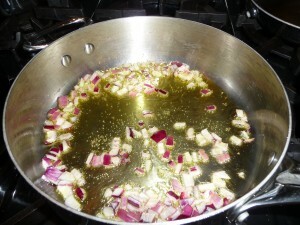 Add the red onions and sauté until the onions start to soften. 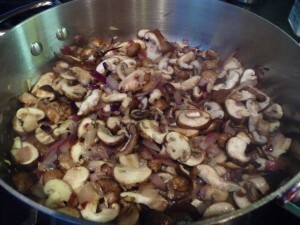 Add the sliced mushrooms and sauté for a few more minutes. 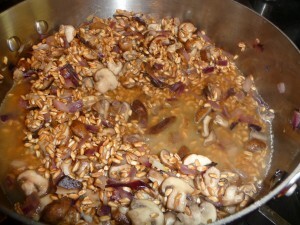 Add the farro and let cook, stirring, for about two minutes. Pour in about a cup of the stock. 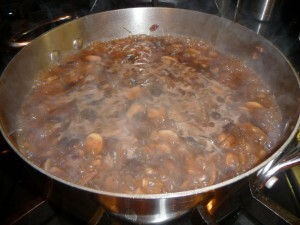 Let cook, uncovered, stirring frequently, until the liquid is almost all absorbed. 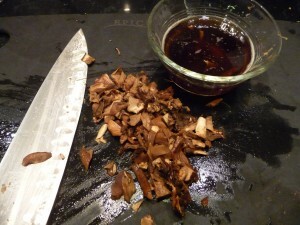 Meanwhile, with a slotted spoon, remove the porcini mushrooms from the wine, reserving the wine. 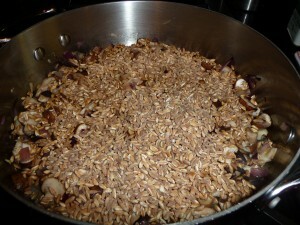 Slice the porcinis into small pieces and add to the farro mixture. Pour in the reserved wine, making sure to strain out the sand. Keep adding stock, a cup at a time, until only one cup of stock remains. 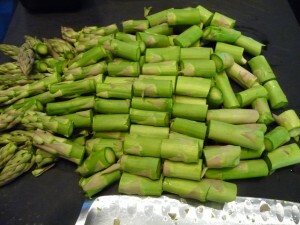 Break the stems off the asparagus. 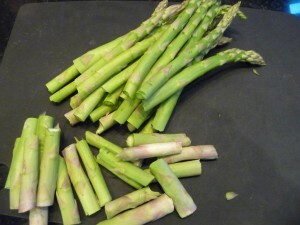 Slice the asparagus into 1″ pieces. 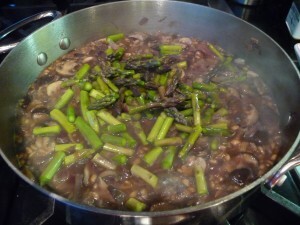 When the liquid in the skillet has almost all been absorbed, add the asparagus and the last cup of stock. 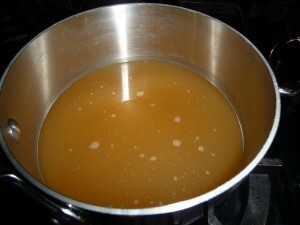 Continue to cook until the stock has been absorbed. At this point, the farro should be tender. Turn off the heat and add the cheese. Stir well to incorporate. 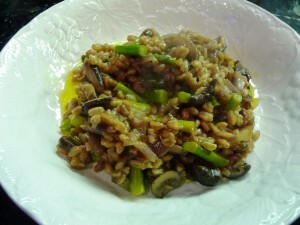 Serve the farro on individual plates. Drizzle with extra virgin olive oil to finish.